However, he has another, more secret passion…art. A graduate of Batley School of Art and the recipient of the John James Hamer Award from the Huddersfield Art Society, Roger has, in his spare time, continued to refine his painting skills. A chance conversation with the Harrison Lord Gallery owner Steven Lord about their mutual friend Peter Brook inspired Roger to show Steven some of his latest paintings. Peter Brook is one of Yorkshire’s most famous artists, some of his work is owned by the Tate Gallery and the Hepworth in Wakefield. A number of years ago Roger met Peter and was inspired to write one of his most popular songs “Peter Brook’s Paintings”. Roger’s work uses caricatures of himself in various Northern scenes which are often inspired by his songs and experiences as a working musician, some even including an impression of Peter Brook in the distance. Roger celebrates aspects of his hometown (Brighouse, West Yorkshire) in much of his work. Familiar scenes depict people, shop fronts, pubs and other buildings in a style which demonstrates a flair and enthusiasm which is uniquely his own. 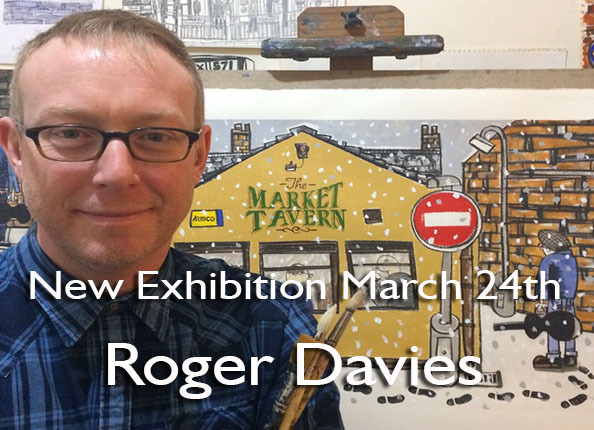 The exhibition is a must not only for all Roger Davies’s fans but also for anybody who loves Peter Brook’s work and paintings of industrial Yorkshire. The exhibition, which is free to enter opens on Saturday March 24th at the Harrison lord Gallery in Brighouse and runs for 4 weeks.